Sony Xperia Z1 Compact vs Samsung Galaxy S4 Mini: Which is best for you? Which one gets your heart aflutter? Sony outdid itself with the launch of the Xperia Z1 Compact, bringing all the power of the full fat version and shrinking it down without much compromise. But those internals won't stop it being compared to the other smaller phones on the market, with one of the most popular being the Samsung Galaxy S4 Mini. Quite rightly, Sony is pushing the Xperia Z1 Compact as more than just another 'Mini' handset that will disappear into tiny handset obscurity. The question remains then, in the quest for a smaller screened device, what are the differences and which one is the right one for you? 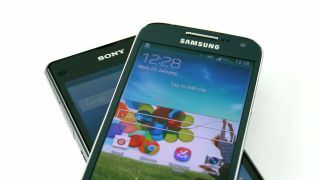 With both the Sony Xperia Z1 Compact and the Samsung Galaxy S4 Mini handsets coming with bigger brothers, it will be of no surprise that the same design DNA in the Sony Xperia Z1 and the Samsung Galaxy S4 is still there, if not a little more petite. The Z1 Compact comes with a far sharper and more industrial look than the S4 Mini, a smart handset hewn of glass and metal. Samsung instead followed a far more natural and curvier look with its handsets and has produced a smooth plastic device with the S4 Mini. That extra heft isn't unwarranted though - the design build of the Z1 Compact is decent, if a little chunky, and feels like it has a slightly higher bill of materials than the Samsung. With that glass and metal construction it'll be no bombshell that the Z1 Compact comes in much heavier than the Galaxy S4 Mini, weighing in a whole 30g heavier than the Samsung at 137g. The Sony is also larger; vital statistics put it at 127 x 64.9 x 9.5mm. Samsung's smaller handset is smaller all round at 124.6 x 61.3 x 8.99 and weighs a mere 107g leaving it sitting in the hand a lot more comfortably. Design differences also spread to the inclusion (or exclusion) of hard buttons and soft keys. Where Sony has left the Xperia Z1 Compact to deal with Android's on screen controls, Samsung has taken its more traditional route with a large central home key and back/menu buttons sat either side. With a quick look at the specs sheet it is clear that the Sony is way out in front. The Xperia Z1 Compact comes with a HD 720p (720 x 1280) screen that leaves the 540 x 960 resolution of the Galaxy S4 Mini a little behind. All those extra pixels in the same 4.3-inch screen mean that the Sony comes out much higher in pixel density too; 342 beats 256ppi every day of the week. Fortunately for Samsung this only tells half the story. The Galaxy S4 Mini comes packing the same Super AMOLED screen technology, which is both extremely bright and comes with higher levels of contrast than the TFT screen of the Z1 Compact. This goes a long way to easing any pain caused by a smaller resolution. It would be harsh to call the Galaxy S4 Mini screen poor. It is more than sufficient for sending messages and surfing the web, or for viewing all those images of cats in funny poses and dogs diving for tennis balls. The added brightness also means that the Galaxy S4 Mini is also easier to use when out and about when sunnier weather hits your window. One of the biggest areas that the Sony Xperia Z1 Compact will look to beat the Samsung Galaxy S4 Mini is the camera. This is because it comes rocking a massive 20.7MP sensor where the Samsung comes with only 8MP. Both the S4 Mini and the Z1 Compact come sporting front facing sensors too, although these are much closer in stature. Sony has made sure it's won the battle, but this time the battle was much narrower; 2MP vs 1.9MP. Samsung and Sony have both also taken a look at the camera app, meaning they both offer up more than the stock Android that sits beneath. Sony has thrown a little more in the way of the camera offering up a few more modes. The more professional photographer may decide they want to forgo the Superior auto mode and take on the Manual mode. This offers up a variety of scenes, as well as allowing the toggle of white balance and exposure. Instagram lovers have also been covered with varying picture effects and filters allowing easy creation of interesting looking pictures without the need for any Photoshop wizardry. An AR mode also adds extra features including elves and dinosaurs... make of that what you will. Samsung's variation comes in the forms of different modes: Auto, Beauty Face, Best Photo, Continuous Shot, Best Face, Sound & Shot, Rich Tone (HDR), Panorama, Sports and Night. These don't add a lot of creative features, instead being aimed at perfecting the more basic shots. Click here for full res image. Colour reproduction on both is very good, although the contrast is much higher on the Galaxy S4 Mini. Much more detail has been captured on the skin of the satsumas though. Colour contrast again is higher on the S4 Mini, with the Z1 Compact appearing a little washed out. With the colours a little washed out on both, contrast levels are still much higher on the Galaxy S4 Mini. More detail on the cushions has been captured on the Z1 Compact. A far greater amount of detail has been captured on the Z1 Compact, with edges appearing crisper. Although the contrast is higher on the S4 Mini, colours are more natural on the Z1 Compact. Oddly, more detail has been captured in the background with the brickwork on houses coming out clearer with the Samsung. The Z1 Compact is much clearer in the foreground with text being much crisper. There is a massive difference in the low light capabilities, with the Z1 Compact's sensor letting in a lot more light. This means that images come out a lot clearer and more visible than on the S4 Mini. The zoom capabilities on the Z1 Compact are a lot greater than on the S4 Mini. Text is also much crisper and more legible on the Sony.